New Zealand Quake Shakes Eagle Sculpture From Airport Perch : The Two-Way The giant bird was being used to promote The Hobbit film trilogy, which was shot in the Pacific nation. Authorities say no one was hurt when it came crashing down during a 6.3-magnitude temblor. 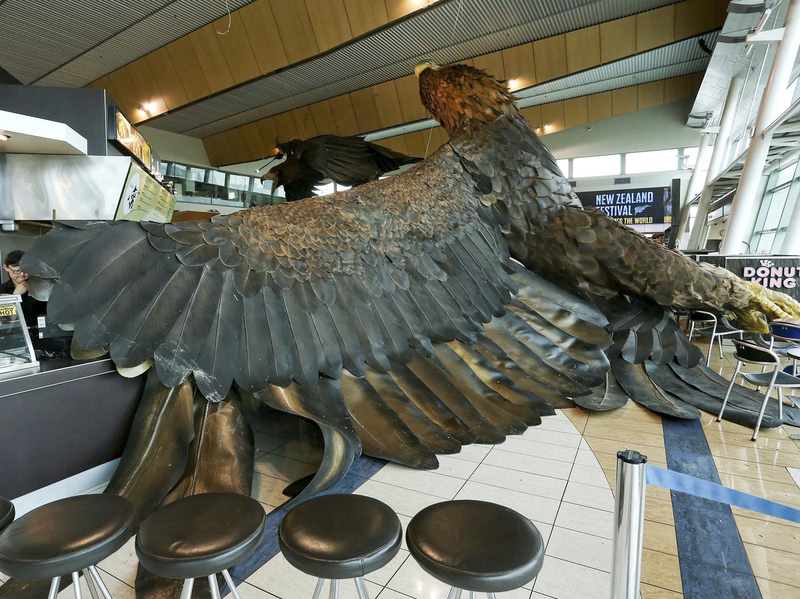 A giant eagle sculpture that was being used to promote The Hobbit film trilogy after a 6.3 quake caused it to fall from the ceiling of the Wellington Airport on Monday. Travelers at Wellington Airport in New Zealand may have felt a bit like Bilbo Baggins on a quest through Middle Earth when a giant eagle descended from the ceiling during a strong 6.3-magnitude quake that shook North Island on Monday. The eagle — a sculpture, actually — was one of two giant birds used to promote The Hobbit films, which were shot in New Zealand. The bird was shaken off its perch in the terminal and crashed to the floor. No one was seriously hurt at the airport or anywhere else on the island, where damage from the earthquake was reportedly minimal. Even so, the temblor was strong enough to shake a lot of people up -– and some of it was caught on video. The New Zealand Herald has a couple of clips, the first of a young girl who appears to be filming herself when the earthquake starts (warning: there's some mild profanity), and another of a greyhound dog race that goes on despite the intense shaking.